The area around the object or text must be transparent. In other words, it should be on its own layer. Want to learn how to use the plugin to make something like this? Click here! Amazing plugin, kudos to you Pyro. Oh, I like, this looks easier than my method of doing shadows. Oh, nevermind, apparently somehow I had the transparent parts of the layer covered in yellow opacity 1... weird, huh? ability to adjust fade step and above mentioned "gradual change"
+1: the fade out seems to be on the last 10-20% of the distance. Would be nice to be able to change this with a slider (like -100 to 100). Request: can the Distance be increased? 500px can be limiting on large images. Thanks! ^^ In these cases, I like to make the maximum value dynamic; based on the size of the canvas/selection. I suspect one reason for the limit is that large values can greatly slow the effect. I don't know what algorithm Trail uses, but I wouldn't be surprised if it basically amounts to searching opposite to the trail direction until an opaque pixel is encountered. For a long trail, that can result in a lot of per-pixel operations. If the high-quality option is implemented by multisampling, then that multiplies the number of operations by the number of subsamples per pixel. For large canvases (where long trails would be most common) the effect may be very slow. There is, of course, the argument that slow is better than unable-to-do-it. 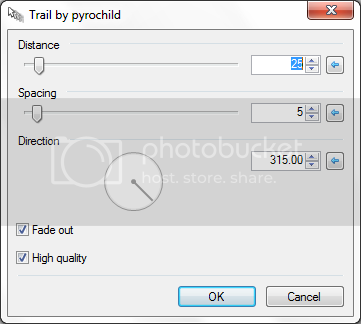 Provided Trail can properly abort the current rendering operations when the settings are changed, so that a user can reduce the trail-length if the effect is taking too long, the problem might not be too bad.